Did you know you can make bourbon soaked cherries for manhattans at home? This is a simple recipe for bourbon soaked cherries using fresh cherries instead of dried. These are also known as manhattan cherries but what ever you call them, don’t forget to make an extra batch to share with friends. If fresh cherries are not in season you can make a batch of drunken bourbon soaked cherries with sweetened dried cherries. Also be sure to try my thyme infused bourbon recipe. A little something special for your bourbon cocktails. This recipe uses fresh bing cherries but feel free to use whatever variety of fresh cherry you have available. You might just find a new favorite. Heavy – equal parts waster and sugar. How to make bourbon soaked cherries. I have two sets of instructions for making your bourbon soaked cherries using fresh cherries. The first is for storing in the refrigerator and the second is for water bath canning making the bourbon cherries shelf stable. If you are lucky enough to pick your own cherries for this recipe, pick a few more pounds and make cherry syrup, easy cherry pie bars, cherry clafoutis and sour cherry pie filling. Cherry season is so short so pick and make! Clean, remove stems and pit the cherries and put them in two clean pint-sized mason jars (or one large quart-sized mason jar). Do your best to minimize space between the cherries. Combine the simple syrup, vanilla extract and bourbon. Pour the bourbon mixture over the cherries. Secure the lids on the mason jars, give them a shake, and refrigerate for at least 3 days before using. The recipe should last for up to 3 months. Heat canning jars in a large canning pot to a simmer. Add cherries to the jars as instructed. Heat the simple syrup to a simmer. Remove from heat and carefully add the vanilla and the bourbon. Stir to combine. Fill jars by ladling hot syrup into hot jars. Wipe the rim of the jar to remove any syrup. Place a clean, new lid on the jar. Place a canning ring/bad and finger tighten. Using a jar lifter, place the jars back into the canning pot. Using a jar lifter, remove the jars and rest them on kitchen towel, wooden cutting board or cooking rack with at least 2 inches of space around them for the air to circulate. 12 hours later, check to see that the lids do not flex when pressed. Wipe clean and store in a cool, dry, dark place for a year. Chop and add to icing and use for the filling of a cake. Eat a few just because. Did you know you can make bourbon soaked cherries for manhattans at home? This is a simple recipe for bourbon soaked cherries using fresh cherries instead of dried. These are also known as manhattan cherries but what ever you call them, don't forget to make an extra batch to share with friends. 1 Tablespoon Vanilla extract, make your own vanilla extract. SO EASY! I have two sets of instructions for making your bourbon soaked cherries using fresh cherries. The first is for storing in the refrigerator and the second is for water bath canning making the bourbon cherries shelf stable. 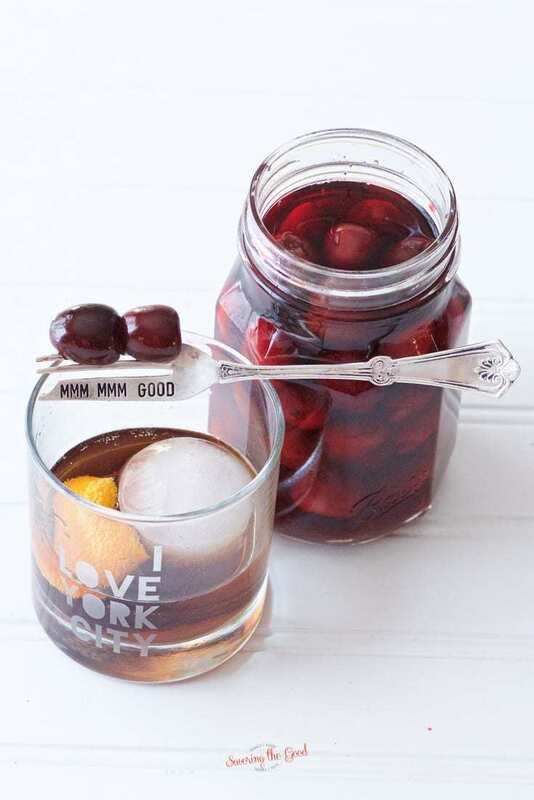 Jarred cherries are so hard to find here so it is great to use our fresh cherries and turn them into bourbon socked cherries! Plus I bought some cherry bitters the other day…..I am thinking I need to make a manhattan with cherry bitters and a garnish of your bourbon socked cherries! Your fork tells no lies, lol! These are so awesome!!! It was the perfect photo prop! LOL I am glad you are enjoying them. Do the canned cherries need to sit for a year before using? Or should be used within one year of canning? They look amazing! NO! No need to sit for a year. Just enjoy them within a year after canning. Once opened and stored in the fridge I use them within 3 months. But they never last that long!